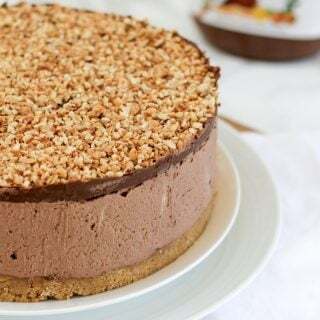 This is the ULTIMATE No Bake Nutella Cheesecake. Incredibly easy and utterly delicious. This chocolate and hazelnut delight is a must make for Nutella fans. Combine the whipped cream, icing sugar, cream cheese, lemon juice. Fold in gently until fully combined. Add the 600g Nutella and stir in thoroughly. Put into the freezer for 2 hours. Gentle warm the 150g Nutella (I pop it into the microwave for 20 seconds) and pour over the top. Cover with the chopped hazelnuts. Pop back into the freezer for an hour. Use my knife tip (above) to remove the cheesecake from the tin. Leave to stand for about 30 minutes at room temperature before serving.